I told you yesterday about my presentation at next week's ShareFEST Conference. Today we "officially" shared the news in a press release. I'm posting the release on the blog for everyone to read more details on what I'll be covering in my presentation. You can catch it below. If you're planning on going to the ShareFEST Conference next week, I wanted to let you all know about the presentation I'll be doing. I'll be turning the spotlight on Merck's use of ProtoSphere to conduct the industry's first virtual poster session. I'll be walking you through the case study and success metrics as measured by Merck. I'll also demonstrate the 3-D virtual poster symposium environment Merck created in ProtoSphere, and show how companies can use ProtoSphere to improve collaborative decision-making with SharePoint. Merck's story was also featured in Nature Chemistry this month, and I'll be referencing some of things covered in the article. My presentation is titled "Virtual Conferences Becoming a Reality." It's slated for Thursday, April 8 from 11:25 a.m. to 12:15 p.m. If you haven't registered yet for ShareFEST, there's still time to secure your spot online. The show will run April 8-9 at the Loews Hotel in Philadelphia. I'll be joined by my ProtonMedia comrades at booth #2. Please feel free to stop by, say hello, demo ProtoSphere, talk shop with us, or share whatever's on your mind about enterprise collaboration. If you can't get to ShareFEST but still want to learn more about some of our customers' stories using ProtoSphere, pull up the case studies we've featured on the blog. I don't really have an axe to grind with Tandberg. But it just seems every time I see news about Tandberg and the way it sells video, my alarm bells go off. So with apologies and all due respect to the good folks at Tandberg, I really need to respond to their recent announcement. The company released desktop telepresence solution, EX90 the other week. I have two main thoughts on it. First off, it might be a step in the right direction as far as enterprise collaboration goes. Any tool that reduces costs and increases efficiency can be advantageous for enterprise users. But it still doesn't solve the broad distribution and enterprise penetration issue surrounding telepresence. At the risk of being repetitive, there are a lot of reasons I don't see all employees in an organization using video every time they want to collaborate. Rather than rehash all my viewpoints, I'll refer you back to some of my previous posts on telepresence. This also brings to mind an article written by Kishore S. Swaminathan, Chief Scientist at Accenture. 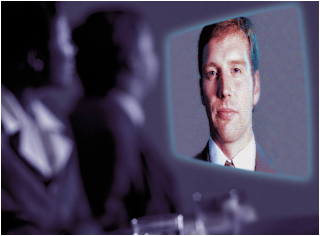 He penned a piece for the company's Outlook journal last month, saying, "Now, a new medium, the videoconference, is rapidly emerging as an important way for executives to communicate with their employees, upper management and customers. By understanding the medium and mastering its dynamics, you can significantly improve your effectiveness as an executive." Hear us out! It's virtual worlds for business, not just virtual worlds. 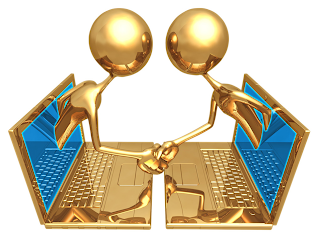 Rafe Needleman wrote a post on his CNET blog, Rafe's Radar, a few days ago about Venuegen's 3-D virtual meeting service. One part of his article that jumped out at me was were he said, "There may be big problems getting everyone in a team to take the service seriously." Couldn't agree more... We've been facing and overcoming those types of misconceptions for several years. The problem is, when people hear "virtual worlds for business," they don't hear the "for business" part. They just hear "virtual world." They immediately think of 3-D gaming and romparoos. As I wrote in the comments, I can't imagine ever having a solution that is going to be liked by everyone who comes in contact with it. However, we've found if you can get people to use the environment as part of a collaborative project, as opposed to just kicking the tires, the real business benefits start to become clear. We have case studies showing that global organizations have serious business collaboration objectives they are attempting to achieve with a 3-D virtual world, and when they measure the outcomes, the results are often astounding. That's not hype. Those are the actual metrics we continue to find and document. When our customers have rolled out ProtoSphere, even the skeptics often come around to understand the true role of virtual world technology in business. And it's through these engagements that we can dispel popular notions about 3-D virtual technology. There's absolutely demand for more engaging and immersive collaboration tools that help people work faster. This is painfully evident is global organizations, where teams are usually dispersed. In those environments, you're dealing with not only demand for engagement and immersion, but also cost reduction, which virtual environments can help you do well. It's a simple equation. No need to travel, means no travel expenses. The savings are obvious. The same can be said of 2-D online conferencing services. But you don't gain the immersion that studies show improve knowledge transfer, knowledge retention, collaboration, and productivity. Let's not forget that people were skeptical about blogs at the turn of the century. And then they were skeptical of social networking. Heck, people were skeptical of computers and the Internet! Skepticism in and of itself can sometimes be part of the learning curve for new technology. We believe that's what's happening with virtual worlds for business. If you've heard me talk about ProtoSphere at any length, you've probably heard me say that one benefit to presenting and sharing information in the application is that it can help avoid "death by PowerPoint." This is because the environment lets users interact around content and with one another, instead of listening to the person with the token present whatever he or she thinks is important. Iggy O, a blogger for In a Strange Land, thought so too. 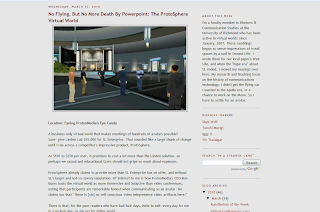 He wrote about ProtoSphere last week, dubbed "No Flying, But No More Death By PowerPoint: The ProtoSphere Virtual World." He talks about our Media Carousel, and how the immersive environment compares to video conferencing. Get the full read by swinging over to In a Strange Land. 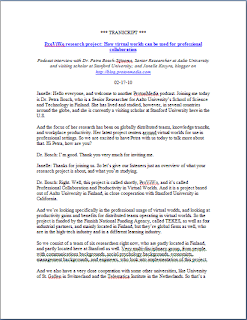 Last week we posted our podcast interview with Dr. Petra Bosch about her latest research project, Professional Collaboration and Productivity in Virtual Worlds (ProViWo). If you're at work right now and unable to pipe sound from your speakers, or if you would rather read through the interview, you're in luck. We've had it transcribed. 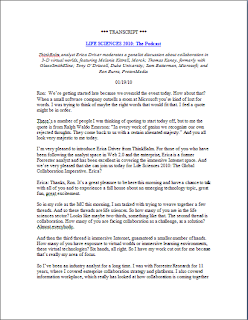 The transcript includes the complete interview between Dr. Bosch and our blogger Janelle, proofed for clarity. We'll be at the show in booth #2, so if you're planning on attending, feel free to stop by, say hello, and pick our brains on virtual worlds. 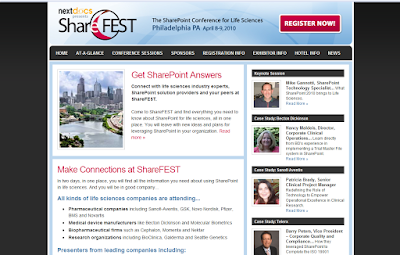 If you're unfamiliar with the ShareFEST Conference, it's a show for life sciences professionals to learn how their organizations can better use Microsoft SharePoint. It will cover how SharePoint is being used at pharmaceutical, medical device, biotechnology, and contract research organizations. And as you'd expect, ShareFEST will be a good way to connect with life sciences peers and professionals working with SharePoint. We'll be busy over the next few weeks prepping for the conference, and we'll keep you in the loop on any interesting updates in our progress. If you haven't done so already, you can register for ShareFEST online. See you there! If you thought we squeezed all the audio/visuals out of our LS2010 event from January, well, think again. We had a bit more water left in the sponge: The transcript of our panel discussion. As you might imagine, proofeading a 90-minute transcript (30 pages!) takes some time. But we wanted to make sure there weren't any typos and our transcriber got everything down accurately. Nothing has been altered beyond correcting typos. Dr. Petra Bosch-Sijtsema and her colleague, Dr. Anu Sivunen, are leading a new research project that studies how virtual worlds can be used for professional collaboration, and if virtual worlds can enhance productivity in globally distributed teams. They've dubbed their project Professional Collaboration and Productivity in Virtual Worlds (ProViWo). Janelle talked to Dr. Bosch recently about it, and we wanted to share their conversation with you in a podcast. The project is based out of Aalto University in Finland, where Dr. Bosch and Sivunen are researchers, and is being conducted in close corporation with Stanford University here in the U.S.
Drs. Bosch and Sivunen began their study in fall 2009, so they're still in their initial research phase. Right now they're interviewing a spectrum of companies that are using virtual worlds. Eventually, they'll explore managerial and user perspectives on virtual worlds at work, and the various collaboration and productivity possibilities. They aim to complete their project in 2012. If you're interested in exploring virtual worlds for your company, if you've already deployed one, or if you just want to keep up with the latest industry research developments, I'd encourage you to take a listen to Janelle and Dr. Bosch's podcast. We hope to follow Drs. Bosch and Sivunen throughout their project, so watch the blog for an update on their progress. 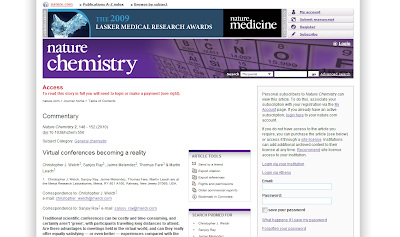 Nature Chemistry covered Merck's ProtoSphere use in its latest issue. The five-page piece details Merck's entire experience, from what their collaboration challenges were; to what they used ProtoSphere for; to the training, collaboration, and knowledge management metrics they pulled out from their deployment. Unfortunately, due to copyright restrictions, we can't feature the article here. But if you're interested in enterprise virtual collaboration and conferencing, the article is well worth the $18 read. You'll get Merck's objective, scientific analysis of their ProtoSphere deployment, including both the positive and negative aspects. 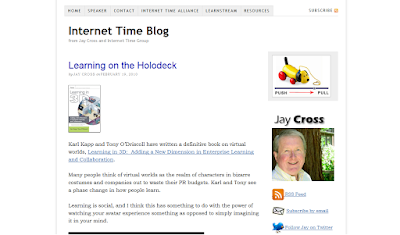 Jay Cross "heartily recommends" Karl Kapp and Tony O'Driscoll's "Learning in 3D"
If you're reading Karl Kapp and Tony O'Driscoll's new book, "Learning in 3D," or planning to, you might want to know Jay Cross has given it his recommendation. Jay is a well-regarded international speaker on enterprise learning. He penned a post on his blog where he pulled out what he thinks are the most valuable parts. So if there are certain things you want to be sure not to miss, surf over to Jay's post. But if you're not in a rush, I encourage you to give the entire book a read. And don't skip the forward. I wrote that. ;-) Jay also gave a nod to ProtoSphere, so thank you! Management of the identity lifecycle is crucial for modern enterprises. The identity lifecycle is established when an employee is hired. 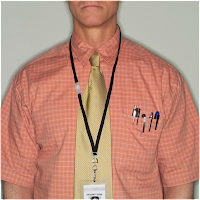 Their role and job determines what information they can access or what building and campus areas they can get into. This changes as they move through the enterprise during their career. And if/when the employee leaves the company, their access rights must be revoked. Most large enterprises deploy identity and access management (IAM) software and elaborate directory infrastructures based on LDAP (Lightweight Directory Access Protocol) or Microsoft Active Directory to facilitate this process. These tools automate things including single sign-on to applications, the ability to handle password resets (which are hugely expensive, costing $60-$300 per reset depending on the system if done manually), and the ability to assign roles and change them. As a collaboration platform, ProtoSphere is tied into the existing tools for managing user identity and identity lifecycle because it integrates with Active Directory. By linking with the Active Directory authentication and groups functions, corporate policies about access rights are mapped into the ProtoSphere virtual environment. So if an employee is allowed to access XYZ information in the organization, he can also access XYZ information in ProtoSphere, no more, no less. For example, only pharmaceutical employees working on the marketing team for Drug A could be allowed to virtually access the ProtoSphere workspace for Drug A, and any of the relevant data feeds visible there. Clinical trial data, competitive information, and manufacturing process information might be contained in that virtual floor. But only authorized employees can access it, as dictated by the firm's Active Directory authentication settings. This makes it easy for organizations to maintain their identity and access policies when working in ProtoSphere, and saves IT a great deal of time and headache when conducting an enterprise-wide roll-out. Systems administrators don't have to maintain multiple sets of credentials or enter and manage potentially thousands of user accounts in the system. The webinar, "Enterprise Learning and Collaboration in 3D Virtual Worlds," covered key concepts from Tony and Karl's new book, "Learning in 3D." They discussed the value of social learning for organizations, and how to integrate existing training and business into productive 3-D virtual work environments. If you have any questions or want to learn more after viewing the slides, hit up Karl's blog where he posted several related informational resources. View more presentations from kkapp.